It was a pan-European project that set out to create a more socially-interactive robot, one capable of providing companionship to children in hospitals. Along the way, however, it thrust Plymouth University into the very heart of a continental debate over the ethics of human-robot interaction. 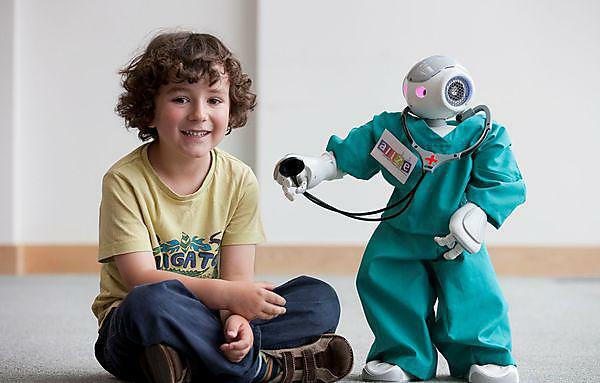 At its launch in 2010, ALIZ-E, a four-and-a-half-year, €8.3 million European Commission-funded project led by Plymouth, considered whether it was possible to develop a robot capable of acting as a companion to a child in hospital. It tasked each of nine partners to use their research strengths, whether it was speech recognition at the National Research Council in Italy, or the development of ‘cloud’ computing techniques in France to power the robots’ intelligence. It became apparent, however, that technology was simply not ready to realise that vision, with naturalistic, meaningful conversation beyond even the capability of cloud-powered artificial intelligence. But as the project progressed through consultation and focus groups with medical staff at San Raffaele Hospital in Milan, one of the partners, a new direction emerged, one that placed the robot in the role of educator. The ‘Nao’ robots – each standing around 60 centimetres tall, and costing around £10,000 – began to work with children in San Raffaele, especially those suffering from diabetes. It quickly became apparent that the young patients warmed to the robots as a social presence. As word of the trial’s success spread, so other hospitals came on board – three in the Netherlands, two in London, and one in Barcelona. It also led to the forging of close links with patient groups, such as diabetes associations in Italy and the Netherlands, who proved hugely influential in finding families eager to take part in the trials. A key part of the project saw Tony and the Plymouth team take the robots to schools right across Devon, conducting research on the interaction with pupils, and using the results to update the artificial intelligence algorithms. At the same time, this offered the team the chance to carry out some inspiring outreach work. ALIZ-E came to a conclusion in 2014, with Plymouth drawing together the research of all partners into a final report. But its legacy effect is likely to go on being felt in a number of areas for many years to come. For example, the EC has now funded a new project called DREAM, which will use the Nao robots in research with autistic children. But perhaps even more profound has been the headway the team has made in terms of human-robot interaction, one that could be applied to hospitals, schools and learning environments, and homes in the community.